Waghela Group - (Neelcon Alluminium) has expertise in manufacturing Sliding Doors and Windows since last 25 years. Sliding Windows for Residence and Commerical Buildings. Various combinations of windows available are Sliding Windows, Casement Windows, Sliding Folding Windows, Vertical Slide Windows, KPA Windows, Opeable Windows, Picture Windows, Partly fixed and Partly Openable Windows. Windows available in Domal series, Geeta series, Minimal windows. 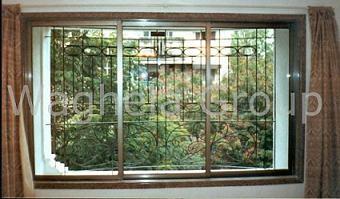 Single Glass & Double Glass Sound Proof Windows are manufactured. We are the only company to provide 12 feet height Aluminium Windows. Entrance Door of 3 feet x 12 feet height are manufactured & Installed. Accessories of windows available for till 10 years. On Time Delivery & Dedicated After Sales Service.